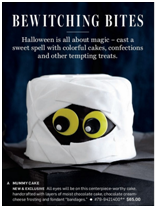 Let us celebrate our new HungryOnion site by making fun of Williams Sonoma 2015 November Catalog. In full disclosure, I have shopped at Williams Sonoma before. However, there are something very unsettling about its marketing strategy and messages. This is especially shown through the Williams Sonoma catalogs, which is why there are Hater’s Guides. They are fantastically funny. So let’s us start with the November 2015 catalog. I will start with with three. Chemicalkinetics says: All eyes will be on you after you tell your guests that you had paid $65 for this crap. Chemicalkinetics says: Thanks God, it is only $79.95, and not $80 for a stupid gravy boat. 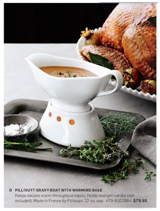 Can’t you at least throw in a candle or two for this $79.95 gravy boat? Chemicalkinetics says: 1/3rd of the catalog is about prepared foods and prepared sauces and spice mixes. 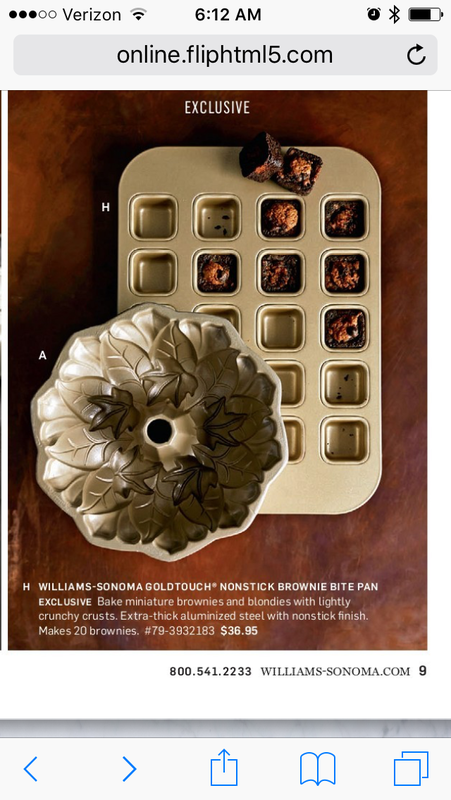 I sometime wonder if Williams-Sonoma is for people who CAN cook or CANNOT cook. 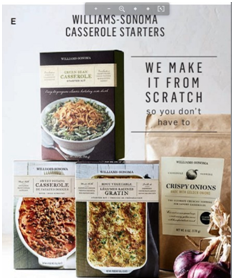 The advertisement slogan is: “We Make It From Scratch So You Don’t Have To”. I am pretty damned sure that any frozen microwave dinner can equally make the same f-king claim. The sweet potato casserole starter includes: brown and white sugar, cinnamon, salt, nutmeg, vanilla, red pepper, oil, pecans, and flour. And a generous amount of packaging. For $14.95. I might have to buy fresh pecans, everything else is in my pantry. See the pretty leaf-laden pan? It’s so exclusive, we’re not even gonna tell you about it, how much it costs or how to order it. Just gaze at it longingly and wish you could bake a special cake in it, but you can’t! NYAH, NYAH! To drive the point home, note the pan is labeled “A” after the “H” nonstick brownie pan. Get it? “HA!” The joke is on you, sucker! Tough luck! Because nothing screams, “I have more money than sense” as much as a seasonal cooking and serving vessel, really only appropriate for dispensing one dish (pumpkin bisque). I mean, heck, would you cook and serve Bolognese in that? Anything else? Wouldn’t it just seem weird to bring that out to the table with ANYTHING ELSE but something pumpkin?! 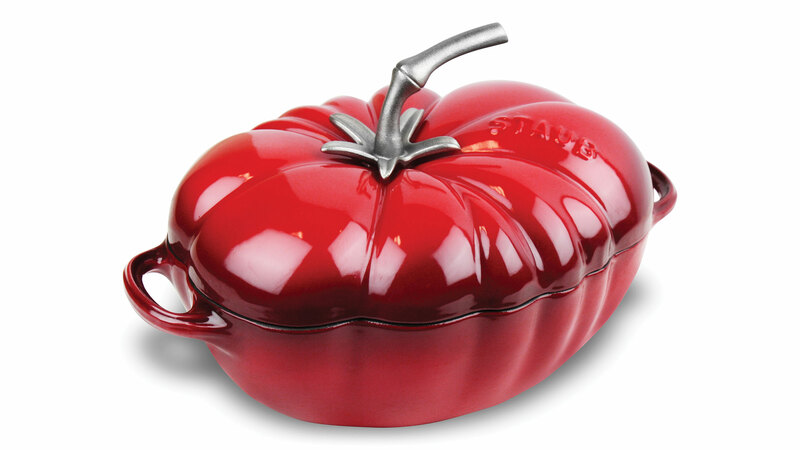 I won’t lie, I love Staub and that pumpkin is exquisite, but I’m an aging Yankee with more sense than money. To drive the point home, note the pan is labeled “A” after the “H” nonstick brownie pan. Get it? “HA!” The joke is on you, sucker! Tough luck! But the shipping is free!!! OK, so I mocked the pumpkin, as its useful life would be seasonally limiting for me, personally. But I was intrigued by the damn thing, and wondered if there were other designs available. Well, GUESS WHAT? Yes, perfect for an Italian-American who loves to cook, a 3-quart Staub tomato cocotte, and it’s not only on sale, but free shipping. HAPPY BIRTHDAY TO MEEEEEEEE! Shop for Staub Cast Iron Cookware including our new popular Staub Tomato Cocotte. 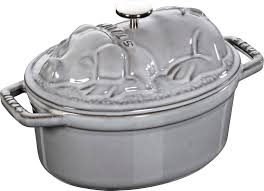 Crafted in France of the finest enameled cast iron this dutch oven is the perfect oven to table piece. What, you have not inherited the estate’s compliment of terrines for game? The ones for hare and stag are available all over, but the one for skunk (in Pepe le Peu striped enamel) has always been a W-S exclusive. You know. If they make the Dutch Oven in the shape of a pig (has to be cute), then maybe I will get one. Kind of like this, but it has to be cuter. I am drawn to this, too! I’d want the whole farm. Who makes this one? Almost looks like it’s wearing a hat, but I think it’s just a funny angle. Very cool! And HA HA HA, kaleokahu, the skunk! Yes, exclusive, for sure. I didn’t look into who makes this. 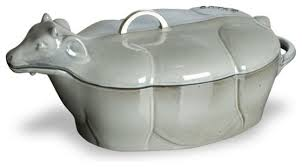 I was just googling some animals Dutch Ovens. Well, because he’s a meal. He’d rather be out in his pen, chatting up a spider. Still quite cool, tho’! Have you seen their knobs? I’ve always lusted after the rooster on the top of what they market as a coq au vin pot. They also have a pretty handsome pig knob. I didn’t know it was sold separately. I have that Staub dutch oven (in grenadine) with the rooster–it was a birthday present I didn’t buy myself. What a treat! Didn’t know you could buy them separately. That pig has your name on it! He looks happier than the one on the Dutch oven.